This is part one of a two-part series that discusses working with XML data with an SQL Server backend. Part two is discussed here. I’ve personally found XML files to be something of a bugbear. They’re going to require some kind of transformation to get it in a format that’s useful for importing or exporting. There are many, many methods to handle XML files but they can vary considerably and it can be confusing for someone new to handling XML. The information is also so scattered over the internet it’s not always easy to figure out what is really the best solution for your particular scenarios. 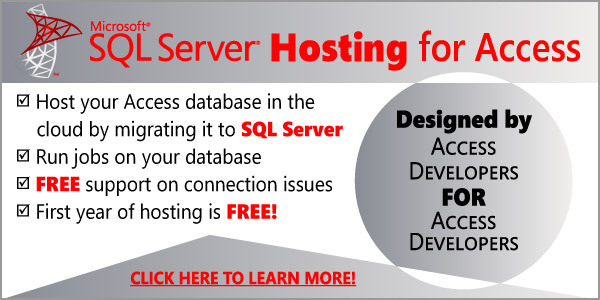 I’ll be addressing this need from two different places — inside Access or inside SQL Server and SSIS. Generally, Access is useful when you need to interact with the files — that is, users need to be able to select the XML files directly or specify where the XML files should be saved to. SSIS is perfect when you want to totally automate the process and you don’t want to bother the user with dealing with loads and loads of XML files that are being sent in or sent out by an automated source. The biggest issue with XML handling in general, is that the number of steps to get from point A to point B can easily balloon if you are not careful. 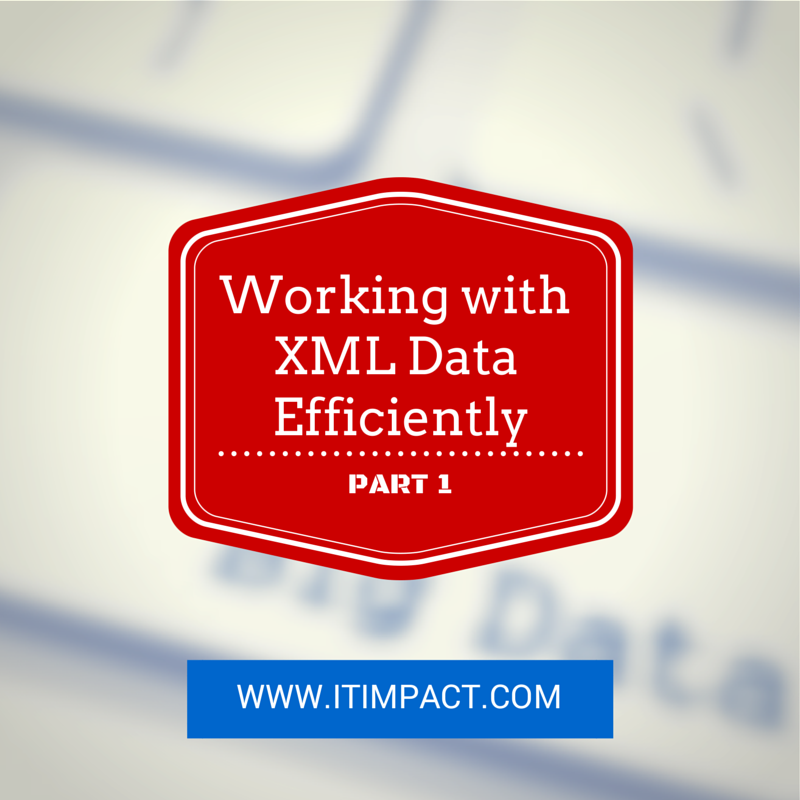 It’s tempting to want to load the XML file as it is into temporary tables, build queries to extract the relevant data and map it to the right columns than to actually insert it into production tables. There is nothing wrong with the process technically, but from a maintenance perspective, this is a nightmare. When you change the XML schema, you now have to update the temporary table’s structure, update the query to include the changes, and in some cases, update the production tables. That’s a lot! Same criticism can be applied to other methods such as using XSLTs to transform XML files into appropriate schema. Likewise, writing a routine to parse the XML’s content and extracting data are inherently going to be so highly coupled that any change in the XML schema could easily cascade into a maintenance nightmare. A common approach I see is to just create a new text file and write XML out line by line, passing in the tag name along with the data. That’s one of worst approaches because now you’re hard-coding not only the data but also the schema! I can understand why some might want to do it – it is easy and doesn’t require becoming familiar with even more technologies. We’ve already had enough technologies and they’re all going obsolete so fast that learning a new tool is intrinsically a risky venture. That said, I’ve come to the realization that there is a better way. Ultimately, the objective is to have most direct translation from SQL to XML and vice versa. Yes, we could use something like XSLT to do the transformation but we’d now be maintaining an XSLT stylesheet that would be obsolete when the XML schema changes. Likewise, I don’t like to write VBA or C# code to handle parsing of an XML document. No matter how you handle it, you are going to have to embed schema into the coding and that’s now one more step to maintain. Using only SQL, we are able to construct a fairly complex XML document. Because this is all done directly in SQL, any schema change needs to be done in exactly one place, via the ALTER statement(s). The output is a single XML document so there is no additional handling we need to worry about. That’s a tremendous advantage to have. Let’s go over some clauses within the SELECT list and see how they work to assemble the XML element. However, ensure that there is only one column with no name. If there are more columns without name, they will be put in the same value for the total which may not be valid. Generally speaking, when building an element that needs attributes and a single value, it’s best to branch it into its own subquery so you can specify the attributes and value precisely and ensure that it is closed accordingly. With the WHERE clause in the subquery, the output changes to NULL which ensures that no order_stats element will be generated for this customer. Type signals that we’re building a fragment of XML and it should be embedded in bigger XML fragment as XML, and not as text. By default, FOR XML PATH generates an element (e.g. the ‘customer’ element) for each row. We can wrap all customer elements with a single ‘customers’ (plural) element. By using ROOT clause after the FOR XML PATH, we can do just that. This then enables you to build a valid XML document that uses only one of two elements per p.ID. There are of course, more tricks but the material above should enable you to generate a wide variety of XML format already and doing so all in Transact-SQL. What about reading it in? With OPENXML, it is fairly straightforward — we basically select an element on which to base most of our work — the customer element. When we need to retrieve data from another node that’s nested deeper than the customer node, we can do so using XPATH. You can see that we were able to get count and total by navigating ‘./order_stats/count’ and we can also read attributes with the @ prefix. A significant caveat: the XML elements are case-sensitive and you won’t get an error. This makes sense when you think about it. Recall how we talked about some customers that ought not to have any order_stats elements. This is still a valid XML document even though the order_stats element does not exist. In this case, SQL Server fills in NULL for OrderCount & TotalAmount fields without throwing up any errors. By the same token, if we mistype the element as “NAME” when it’s actually “name”, we’ll get NULL value for that field even though there were actually data in the name element. Therefore, take care when you are mapping the elements to fields. But where did XML data come from? So far, we’ve discussed how SQL Server can manipulate XML data but we haven’t really talked about how we’d get the XML data, especially when it comes from file(s) somewhere else. This will be covered in part two. You’re welcome, Patrick! I hope you found it useful. The sample data has its character entity references escaped. I guess it should not be this way. Patrick, you are correct. We had changed how we formatted our code on our blog recently and this seems to be a side-effect. We’ll fix this up. Thanks for pointing this out! “SQL Server fills in NULL for OrderCount & TotalAmount fields”. Do you mean to say CountOfOrders? I see what you mean, grovelli but it is actually OrderCount — I wasn’t consistent. I had defined the XML’s column ./order_stats/count as “OrderCount” even though earlier in the article I used the “CountOfOrder” when building up the XML document. As things stand, they are correct, just not consistent. Thanks for the catch!